Have you suffered a serious forearm fracture or a broken forearm in an accident that wasn’t your fault? Whether it was an accident at work, a road traffic accident, or an accident in a public place, if someone else is liable for your injury, you could be entitled to thousands of pounds in compensation. We are Legal Expert, a well established legal advisory service that helps victims of forearm fracture accidents claim the fractured forearm compensation that they are entitled to. Call us today on 0800 073 8804 to be matched with an expert personal injury solicitor to handle your case, at no extra cost to you. In this case study, we are going to look at the case of Mr D (whose name we have shortened for reasons of privacy). Mr D was working as a self-employed contractor for a chemical company, Croda Chemicals. He was working on removing a pump from the ground floor of his plant when his forearm was hit by a section of pipe that had fallen from possibly two stories above him, breaking his forearm upon impact. Is it harder to claim compensation for a personal injury if you are self-employed? A common misconception is that if you are a subcontractor who has an accident at work or a self-employed contractor who experienced an accident at work that you cannot claim compensation for your injury. Self-employed people are responsible for their own safety in a workplace where they are visiting. However, it is possible to sue for compensation if you have a personal injury and are self-employed if you can prove that your accident was partly due to the negligent action or inaction of another party. As a self-employed subcontractor who experienced an accident at work due to a falling pipe, Mr D was not responsible for his accident so was entitled to claim fractured forearm compensation from the company Croda Chemicals where, as a subcontractor, he experienced an accident at work. Claiming compensation for a work-related injury when you are self-employed can be a complicated process, so it is essential that you hire an experienced personal injury solicitor to represent you in your case. Despite what your friends may tell you, a serious forearm fracture, a broken wrist or a broken arm are all very similar injuries. Broken or fractured forearm symptoms can include: bruising and swelling, severe pain and tenderness, the arm or wrist being an odd shape, bleeding or in severe cases the bone protruding through the skin. Your forearm is made of two bones, the radius, and the ulna, with most adult fractures occuring on both bones. Ulna fractures to the wrist can also occur, and if the serious forearm fracture is not effectively treated as soon as possible radius and ulna fracture complications are a risk. Fractured forearm recovery time is usually between 4-8 weeks. Most fractured wrist injuries are treated by putting the arm in plaster and allowing time for the bones to knit. This NHS guide on a Broken Arm, or Broken Wrist has more information. As a result of suffering from a broken forearm, Mr D was unable to work for several weeks. This, of course, meant that he suffered a loss of business, which subsequently resulted in a loss of earnings during his fractured forearm recovery time. Mr D’s personal injury solicitor negotiated a [£32,306.64] fractured forearm compensation settlement for him. As well as damages for his pain suffering and loss of amenity, the settlement also covered his loss of income during the period that he was unable to work. Have you suffered a serious forearm fracture or a broken forearm in an accident that wasn’t your fault? If you would like to claim fractured forearm compensation then you may want to consider using a no win no fee solicitor. This means that your personal injury solicitor will offer you a Conditional Fee Arrangement (CFA), also known as a no win no fee service. This means you will only pay your solicitor’s fee if you win your claim for personal injury compensation, meaning there is no financial risk to you. With no win no fee, there is nothing to pay upfront, which makes it a more affordable option, which is especially helpful if you have lost income as a result of your injuries. 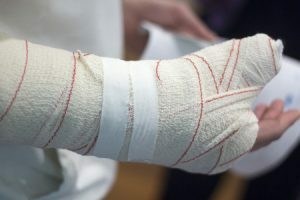 At Legal Expert, we can match you to a no win no fee solicitor who can win your case for compensation for a serious forearm fracture, even if you are self-employed. Call us today and if you have a valid claim, we will match you to an expert no win no solicitor to handle your case. Contact us today to enquire about making a no win no fee claim today. We are Legal Expert, a trusted legal advisor that specialises in matching Claimants with expert personal injury solicitors, many of which have 30 years of experience. If you have experienced a serious forearm fracture, fractured wrist, ulna fracture symptoms or a broken wrist in an accident that wasn’t your fault, then we can help you sue the liable party. Whether you suffered an accident at work (and were an employee or suffered a work-related injury when you were self-employed), in a public place, on the road or elsewhere then we will handle your case to get you the compensation you are entitled to. Call Legal Expert today, or use our online claims form to tell us about your serious forearm fracture. An advisor will speak to you to let you know if you have a valid case, advise you on how much-fractured wrist compensation you could claim and match you to a solicitor with the right expertise to help you, all at no extra cost to you. Call today to start your claim. We’re looking forward to hearing from you. An NHS guide to a broken arm and wrist symptoms, treatments and advice on recovery time.